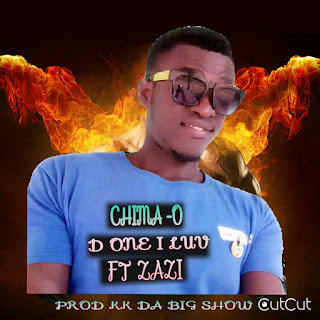 Home / NAIJA MUSIC / Music] Chima - O - D One I Luv (Feat. Zazi) Download mp3. Music] Chima - O - D One I Luv (Feat. Zazi) Download mp3. Goodnews Chimaobi Amadi, popularly know by his stage name Chima - O (CO) or Chima-O music world. Chima-O is a Nigerian singer,songwriter, multi instrumentalist and performer. Chima-O was born on 11th October 1990s in Rivers state, Nigeria. He hails from Akwa, Etche LGA, Rivers state, Nigeria. Chima-O is the fourth son and last born in a family of five (four sons and one sister). Chima-o is known for his modern appeal of afro hip hop. Chima-o began his music career at his local church in Rivers state. Chima-o is also very skillful in playing guitar and keyboards. Chima-o was just 11 years of age when he started playing the drums for his church choir in Rivers state. In 2007, Chima-O in his secondary school days in County Grammar School Ikwerre/Etche released his first single shake ur body featuring his two late friends who died on a motor accident same day 2016, Senator B and Play B. May their soul rest in peace. In 2008-2011 released ur love, my destiny,Ala Etche,loose control. In 2012 Chima-O was admitted into Ignatius Ajuru university of Education Rumuolumeni Port Harcourt, Rivers state, Where he studied Political Science with a minor in education. In 2014 Chima-O released another hit track "Follow me" and in 2015 Chima-O released "Adanma" which earned him the "BEST ARTISTE OF THE YEAR AWARD, by the STUDENTS UNION GOVERNMENT before he graduated in 2016. In December 2018 Chima-O released the unavoidable romantic melody with the on going shaku shaku dancing step, the song cascading all over the Country"D_ONE_I_LUV" Featuring the fast rising female Artiste ZAZI ZARA. Tribute to grand ma- Bryto ft Chima-O, Rivers state- Bryto ft Chima-O.etc.